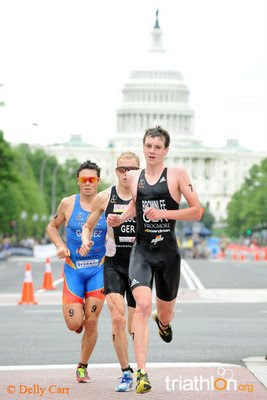 Since the ITU circuit was in my neck of the woods (sort of..), I made the trek down to our nation's capital to watch the third leg of the ITU World Championship Series (WCS). And it was well worth the trip because I got to watch two amazing races. The first thing you notice is the atmosphere that surrounds the event. Everything about it breathes elite racing. The start line is not composed of a few elite athletes with a lot of part-time "pros". It is entirely composed of elite, professional athletes. Athletes with Olympic aspirations, competing for very good (for our sport...) prize-money. Because of the level of the athletes, everyone watching either at the race site or at home through the Internet were treated to two very competitive races, with constant changes in the dynamics of the race, which made them both interesting and very fun to watch. When I got back home at the end of the day, I checked how Ironman Coeur d'Alene was going. And the contrast with the ITU WCS race was evident. With extremely weak fields, both men's and women's race were far from exciting, with second place for the men being 10 minutes behind the winner and third place almost 20 minutes down (!). The women's race was a little more "exciting", but just for the battle for second place. All this for the first Ironman race of the year in US soil. The writing is on the wall: professional Ironman racing is dying. This is not new, it's been a slow death, brought on by stagnating prize-money purses and the increased number of races, causing a watering down of the competition. But this slow death is somewhat puzzling given the growth of the sport in the last years. With its logic of maximizing the profit out of the events that runs, the WTC is showing an incredibly narrow focus that is hurting the sport as a whole. This effect might not be noticeable right now, but it will be in the future. I just read this thread on slowtwitch and I was curious why you said what you did. Is it your belief that it is not effective to run after biking in training? Only at certain times in a training cycle? Never? I always thought it was part of the sport specificity in triathlon training. I'm interested to hear your thoughts. Running off the bike is specific to triathlon, it's just that running off the bike all the time is not specific. Running off the bike is not different from pure running, and there is even evidence to prove this. So in order to have a good running performance in triathlon, the main goal is to build fitness on the run. If you are running off the bike too much in training, you will take away some quality from your running training, thus preventing you to build your running fitness. Certainly running off the bike is a skill that needs to be worked on, especially for those just starting the sport. But for the more experienced athletes, it is less important and running off the bike should be done maybe one time during the week. The exception to this is for time-constrained athletes or for ITU racing. 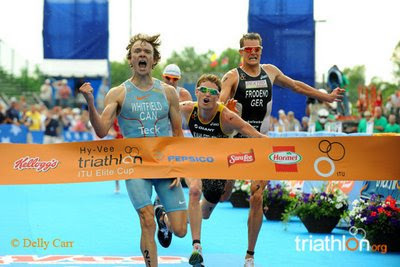 In ITU racing, athletes run their fastest pace of the whole run right out of T2 and at the end. So learning to transition to run your fastest pace right off the bike is important. But again, this can be trained by doing specific workouts, not by running off the bike all the time. As a general comment, I will remind you that specificity, as with the other training principles, is a pretty complex concept. It does not mean that training should emulate racing, it means training should reflect the needs and skills required by racing.